W51 contains multiple clusters of young stars. The Chandra data show that the X-ray sources in the field are found in small clumps, with a clear concentration of more than 100 sources in the central cluster, called G49.5−0.4. Although the W51 giant molecular cloud fills the entire field-of-view of this image, there are large areas where Chandra does not detect any diffuse, low energy X-rays from hot interstellar gas. Presumably dense regions of cooler material have displaced this hot gas or blocked X-rays from it. One of the massive stars in W51 is a bright X-ray source that is surrounded by a concentration of much fainter X-ray sources, as shown in a close-up view of the Chandra image. This suggests that massive stars can form nearly in isolation, with just a few lower mass stars rather than the full set of hundreds that are expected in typical star clusters. 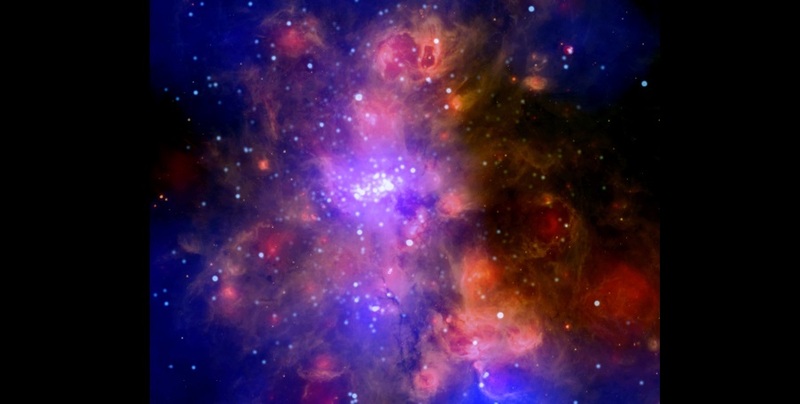 Another young, massive cluster located near the center of W51 hosts a star system that produces an extraordinarily large fraction of the highest energy X-rays detected by Chandra from W51. Theories for X-ray emission from massive single stars can't explain this mystery, so it likely requires the close interaction of two very young, massive stars. Such intense, energetic radiation must change the chemistry of the molecules surrounding the star system, presenting a hostile environment for planet formation. A paper describing these results, led by Leisa Townsley (Penn State), appeared in the July 14th 2014 issue of The Astrophysical Journal Supplement Series and is available online.